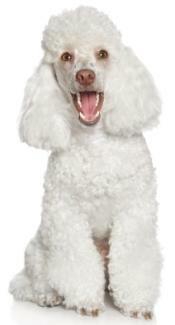 If you've learned how to groom a poodle, you learned that if you want to clip his nails, you need to be careful. It's very painful if you cut the quick of the nail which will bleed. If you want to know how to tell if your pet's nails need trimmed, stand him on the grooming table, and see if they touch the table. If so, they need trimmed. Trim them so they don't touch the table; trim only the tips of the dog nails. To miss the nail quick (a blood vessel running down the middle of the nail) and avoid bleeding and causing your pet pain, cut below the nail curve. If the quick is cut and bleeding ensues, styptic powder or cornstarch stops it. You can choose from 3 styles of nail clippers. Guillotine clippers have a blade that goes across to clip the nail. There are also clippers that close together and those that cut like scissors. Do one paw at a time being very careful not to trim too short and cause pain and bleeding. Hold the paw in your hand with your thumb on top of the foot and your other fingers underneath the foot. Once trimmed, use a file to file the nails so they're smooth and less likely to get caught on something. If your dog doesn't like nail trimming, you can try just filing all the nails or buying a grinder. It has a rotating wheel that grinds the nail down. 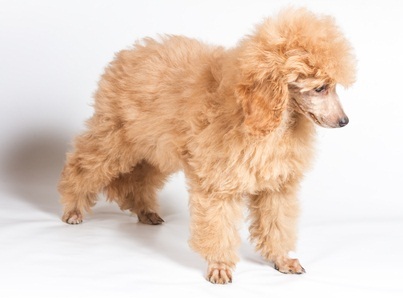 Grooming poodles entails more than just cutting the hair. If you're not comfortable with trimming your pet's nails for fear of hurting him, let the groomer do it. It will be less stressful for both you and your poodle. Schedule nail trims in with your pet's regular clipping, and you'll find it's much easier to do that than worry about hurting him or her.